CHARLOTTE— UMBC came into the second round of the 2018 NCAA tournament with nothing to lose. The No. 16-seeded Retrievers fetched their first-ever win with a 20-point blowout over top-ranked Virginia on Friday night, turning the sports world upside down. America’s favorite underdogs tried their luck at creating shockwaves again against ninth-seeded Kansas State. As luck would have it, the “top dogs” came up short when It mattered most losing a heartbreaker against the Wildcats by a final of 50-43. 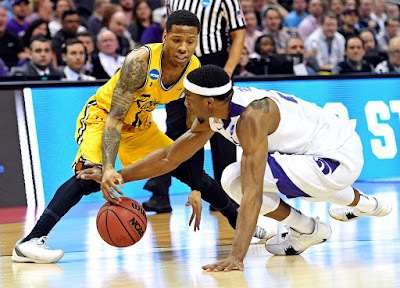 Kansas State proved they were supreme through most of the unlikely matchup with UMBC, but were vulnerable at times. “I think if it didn’t get their attention that they beat Virginia by 20, the number one team in the ACC, in the conference that they won the conference and the tournament, it had to catch their attention," Kansas State coach Bruce Weber said about his team. The Wildcats advance to the ‘Sweet 16’ for the third time in school history with the last appearance being in 2010. All with a terrible shooting performance, going 18-of-44 (40.9 percent) from the field and a season-low 1-8 (8.3 percent) from three-point range. In what seemed like a back-and-forth affair, the Retrievers unexpectedly stormed back down by six with 18:45 left in the second half and would close within to 34-33, at the 11:08 mark. A forced drought by K-State kept UMBC without a field goal nearly eight minutes, until a three-pointer by Jairus Lyles with 6:33 left. The 50 points for Kansas State were the fewest in a winning outcome and also ties the fewest scored since defeating No. 1 seed Oregon State in the second round of the 1982 NCAA tournament. The 43 points for the Retrievers was the least amount the Wildcats have allowed an opponent to score all season. For UMBC, the Cinderella team that came out of nowhere to win the American East Conference, held their heads high and realized what this moment meant for the program. “Certainly, we were a 16 seed, that’s where it all started,” UMBC coach Ryan Odom said. “When you watch this team and how they played, they play with passion and with heart. They play together which is what we say when we’re in the huddle. We do things together for one another.” The Retrievers under Odom finish the season with a 25-11 record overall. As for the Wildcats, they’ll move on to Atlanta for a ‘Sweet 16’ meeting on March 22 with No. 5 seed Kentucky. The “meeting of the Cats” features two defensive minded teams looking to play another night.